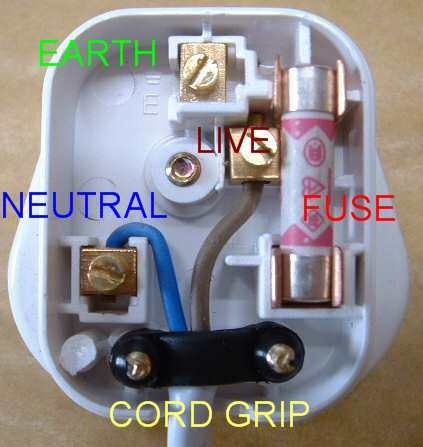 The most common mistake in wiring a plug is making each wire the same length. As all pins are not equidistant, this makes the brown wire, which has the shortest distance to reach, far too long. This in turn causes the current carrying wires (instead of the main outer cable) to be clamped in the cord grip. It's important to ensure the outer cable is secured by the cable grip so that wires cannot be pulled out. This is even more important on things like vacuum cleaners and irons where the lead is constantly being moved and pulled during use. Once you have cut away the outer cable to expose the live, neutral and earth wires you will find they are all the same length. Hold the cable in position over the cord grip and cut each wire to length. After stripping back approximately 5 mm of insulation on each wire, push the outer cable under the cord clamp (or between the cord grip depending on type of plug) and wire the plug.